We live an era of social crisis. In the year since Trump ascended to the White House, big debates have opened up about how to stop his reactionary agenda and a new generation of young people have taken to the streets. Millions are asking: how do we defeat the racist forces emboldened by Trump; how do we stop the seemingly endless tragedies of gun violence; and how do we address the huge inequality, poverty and alienation that plague U.S. society? 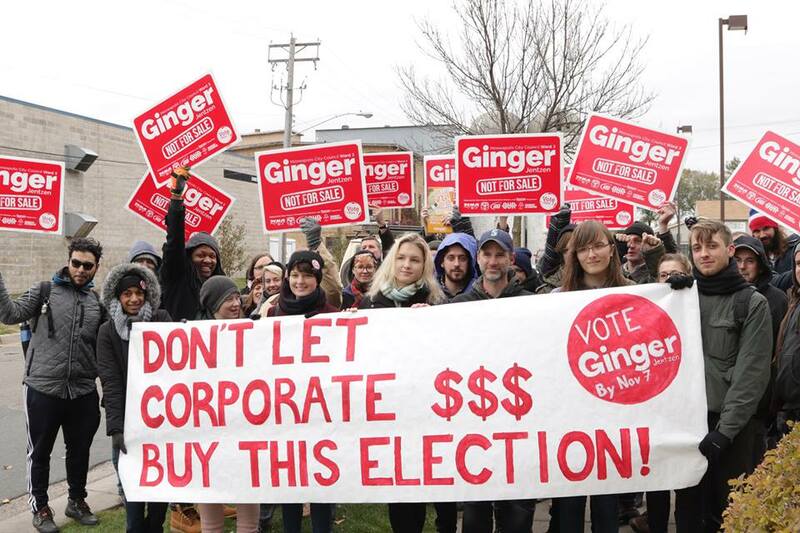 Last fall, Socialist Alternative’s Minneapolis City Council campaign for Ginger Jentzen nearly elected a second Marxist to office, in addition to Kshama Sawant in Seattle. In both Seattle and Minneapolis, Socialist Alternative led the way in passing a $15 minimum wage, in building the fight for rent control, and for taxing the rich and big business. We have used elections, and elected office, as weapons with which to fight for the interests of working class people and youth, and have done so to powerful effect. But fundamentally, we disagree with much of the rest of the left about the role of elections and how to approach them. Over the course of the nine-month-long Ginger Jentzen campaign, we saw how different progressive forces oriented toward the Minneapolis elections, and how many of the debates currently taking place played themselves out on the terrain of Midwest city politics. We think there is much to learn that is useful for the broader political discussion. Bernie Sanders and his supporters launched Our Revolution in the final months of the 2016 presidential election as an organization primarily aimed at reforming the Democratic Party. In Minneapolis, following Trump’s election in November, Our Revolution Twin Cities hosted meetings of approximately 700 people, with trainings aimed at bringing a progressive challenge by running for City Hall. While positioned to the left of incumbents, the Democratic candidates backed by Our Revolution spanned a wide range of political tendencies. Instead of running its own candidates where others could not be recruited, or threatening to withhold endorsements where candidates would not base themselves on a clear left political program – like rent control, taxing the rich and strong community oversight to hold police accountable – Our Revolution focused instead on the pragmatic goal of winning a majority on City Council. This led them to abandon their leverage and support a number of candidates with cautious campaigns, many of whom did not even follow Bernie Sanders’ example of rejecting corporate cash. Our Revolution did play a progressive role in putting some leftward pressure on candidates in the endorsement process, especially forcing candidates to embrace a $15 minimum wage. However after getting endorsed many veered back under establishment pressure toward status quo politics. Even where confronted with a clear left program, as in the case of Ginger’s campaign, Our Revolution chose to hedge its bets, ultimately endorsing both Ginger and Democrat Steve Fletcher, giving Fletcher important progressive cover in spite of his pro-corporate program. While we have had a very sympathetic approach to Our Revolution at every stage, we think the weaknesses of their approach in Minneapolis was rooted in their project of reforming the Democratic Party and the narrow political calculus it leads to. The Green Party candidate in Minneapolis’ Ward 3, Samantha Pree-Stinson, got around 10% of the vote in our race, reflecting in part a genuine base of people who saw voting for a woman of color as an important step to combat the realities of systemic racism in Minneapolis. Unfortunately, Pree-Stinson ran to the right of both the Green Party’s program and our main Democratic Party opponent, Steve Fletcher. She counterposed entrepreneurship to working class victories like $15/hr, blamed rent control for rising housing prices, claimed that our slogan “Not for Sale” referenced slavery, and implied that Ginger’s presence in the election showed the limits of Socialist Alternative’s commitment to fighting racism (an argument she didn’t level against our Democratic opponents). She pointedly ran against Socialist Alternative’s campaign rather than either of the corporate candidates, with ongoing political attacks on Ginger in social media and candidate forums. While the Green Party correctly identifies the need for an alternative to the two corporate-dominated parties, they have unfortunately increasingly elevated independent politics into a goal in and of itself, an approach which can risk sacrificing the interests of working class people. The Greens have played an important role in fighting for independent politics, but they need to refocus on the political programs of the candidates they support as well as orient more toward social struggles. Allowing pro-corporate candidates to run on the Green ballot line, and even backing them up in Pree-Stinson’s case with national party support, raises real questions about their direction. At the same time there is a relentless assault on 2016 Green presidential candidate Jill Stein taking place, trying to link her to Russia as part of a smear campaign to intimidate independent candidates, disgracefully backed by Democratic leaders. While we do have some criticisms of Stein’s campaign as we have explained before, we endorsed and supported her candidacy for president and we completely reject these reactionary attacks. Many progressives argue that using the Democratic Party’s ballot line is the best way to get insurgent left candidates elected. At present, live debates on this question are taking place within the Democratic Socialists of America (DSA). Much of the left of DSA currently supports the idea of pragmatic use of the ballot line of the Democratic Party, while at the same time registering doubts about whether it can be turned into a genuine left party. Partly in response to this debate, a new left caucus within DSA (the Refoundation Caucus) has been initiated that argues for running independent socialist candidates to build toward a new mass party, and which has begun a joint initiative with Movement for a People’s Party (formerly Draft Bernie). Last year the DSA endorsed a number of independent candidates, including Ginger Jentzen. Unlike Our Revolution, they did not also endorse our Democratic opponent, Steve Fletcher. But at the same time, around the country a number of DSA candidates ran as Democrats. It is generally true that in a given election cycle running on a Democratic ballot line can make it easier to get elected. However this one-election-at-a-time approach contains within it a major strategic concession to big business. It helps block the development of what will really be needed to win major progressive change: a new working class party independent of corporate cash that works alongside social movements rather than acting as a brake on them. While we think that the forces do not yet exist outside the Democratic Party to launch a new working class or even broad left party at this moment, we need to take important steps right now to prepare the ground. This means rejecting the pressures to be drawn into the Democratic Party or to adopt a political program more tolerable to Democratic leaders in order to maximize chances of endorsement or winning a given election. Instead we advocate running independently on a clear left program as a key step in the direction of a new party, and using such campaigns to boldly fight for left and socialist ideas that mobilize working people and youth into struggle. We welcome the dramatic growth of DSA to 30,000 members, but disagree with them on this fundamental question of the need for working class independence in politics. Many progressives see elections and winning elected office as the main path to change society, and as the midterm elections approach more and more people are understandably looking to the ballot box to deal a blow to Trump and the Republicans. Socialist Alternative views elections as one of many tools the working class can use to fight for its interests, but see social movements and the collective power of working people as the key vehicles for change. The left’s tactics around social movements and elections should go hand in hand. Socialist Alternative uses election campaigns to build the strongest possible grassroots struggles to force concessions from the establishment, whether or not the individual campaign wins or loses. The Ginger Jentzen campaign fought unapologetically for rent control and taxing the rich to fund affordable housing because that’s what working people need, and because we correctly anticipated that we could mobilize powerfully around these bold demands. We knew the Democratic establishment was fiercely opposed to rent control, but our goal was to advance these struggles not curry favor or win a Democratic endorsement. And we succeeded: we forced rent control front and center in the Minneapolis elections and built strong momentum on the issue which has continued to the present day. We did the same with Ty Moore’s 2013 Minneapolis City Council campaign on the $15 minimum wage, and used it as a springboard to launch the fight for $15 which ultimately won out in spite of years of Democratic opposition. It is understandable that many are looking to reform the Democratic Party. But turning the Democrats into a party for working people would require far more than electing left Democrats. The party as whole would need to reject corporate campaign contributions. It would need a binding platform and genuine democratic structures capable of holding its elected officials accountable. But Democratic Party leaders would sooner leave their party than accept such conditions. The Minneapolis Democratic Party (DFL) establishment was fully prepared to break with its own platform to defend business interests. Powerful Democratic donors did not bat an eye in donating to “Minneapolis Works!”, the corporate PAC dedicated to opposing key sections of the DFL platform like $15 an hour, affordable housing and police reform. Democrats criticized Ginger far more loudly than they did Tim Bildsoe, a former Republican who cynically adopted the DFL label while backed by a “who’s who” of corporate interests. This is why Socialist Alternative calls for working people to build their own political party. Ginger’s campaign confirmed again what Bernie Sanders’ campaign outlined: that lots of people are looking for fundamental change. We believe that organizing around class issues is the best way to win over the many who are currently alienated by the political establishment to join us in fighting for a different kind of society. This is the third article in a series on last year’s Ginger Jentzen campaign for Minneapolis City Council. Next articleInternational Women’s Day 2018: Capitalism Oppresses Women – Fight for Socialism!